However, “smarter” is probably the wrong term in this case, as the sentence prior to this one explains: “It turns out that young children may be more open-minded than adults when it comes to solving problems” and later in the piece that “children are better at solving problems when the solution is an unexpected one”. But you really don’t need research to understand that young children are far more willing to experiment and play with new situations, like electronic devices, than older kids and especially adults. 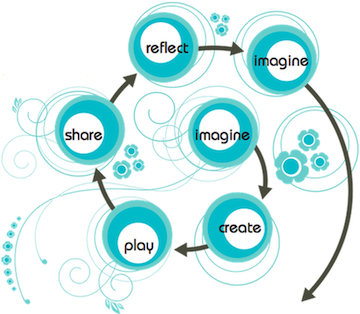 Anyway, all of this reminds me of the work of Mitch Resnick, director of the Lifelong Kindergarten Group at the MIT Media Lab, who a decade or more ago was writing about how we need to spread the learning process followed naturally by 5 year olds into the rest of K12. Instead of forcing the artificial processes of “formal” learning from upper grades down into early education. Last month, a segment of the NPR podcast On The Media discussed the origins of the word “hacker” and it got me to thinking: why aren’t we teaching our students to be hackers? Ok, I know the term has something of a bad connotation, largely due to it’s use by the media as a “lazy shorthand” for anyone who uses a computer to commit a crime (even though, in most cases, the “hack” involves little more than finding or guessing someone’s password). However, ignore that for the moment and look at the more original meaning, which was a term of praise and admiration applied to someone who understands the foundations of a particular technology and works to learn more about the details by playing, manipulating, using, and altering it in ways the designers never thought of. So then what is hacking? Let’s trace the term back about five decades to a student club at MIT called the Tech Model Railroad Club. STEVEN LEVY: Â The people who were working underneath the table, where on top of the table there was a very elaborate train layout, called themselves “hackers” ’cause they hacked away this very complicated system that ran the trains in a very sophisticated manner. Hacking meant fiddling around with technology in sort of an irreverent and makeshift way. I first learned about of the concept from Levy’s influential book “Hackers: Heroes of the Computer Revolution” and it was an earlyÂ inspiration for digging deeper into computers and networks. Which means my interpretation of the concept is likely way off from that of most people.Â But that’s ok, because there are many synonyms for the same idea. If you think about it, most scientists understand hacking; they call it experimentation. They with some basic knowledge and observe what happens when they try something different. Or musicians call it improvisation, where the artist takes the notes on the page and twists them around in imaginative ways. The whole idea of hacking is also directly reflected in this cycle of how young children learn by experimenting with their surroundings. It comes from the writings ofÂ Mitch Resnick, director of the MIT Media Lab‘s magical Lifelong Kindergarten Group, the people who created Scratch and Mindstorms, two great hacking systems for kids. Then there’s the rapidly expanding maker movement in which people learn to use (or reuse for some of us) physical tools to alter and improve elements of their environment. All of which is tied together by research showing that kids (and many adults for that matter) “conceptualize ideas and understand issues in greater depth” when they get their hands-on and tinker with science and technology, instead of just reading about it. In the end, I suppose it doesn’t matter what you call the process. We just need to get away from the idea that learning is primarily an academic process, that everything worth knowing can be evaluated using standardized tests. And help kids learn how to hack their world. I love the way Twitter can trigger some interesting connections. Case in point, this rant started with a tweet from this afternoon. Clarence makes a great point since the process used by the Mythbusters is very much rooted in solid science while being very hands on. Not to mention a lot of fun. But my warped little mind also saw a link to the work of Mitch Resnick, director of The Life Long Kindergarten Group of the MIT Media Lab. 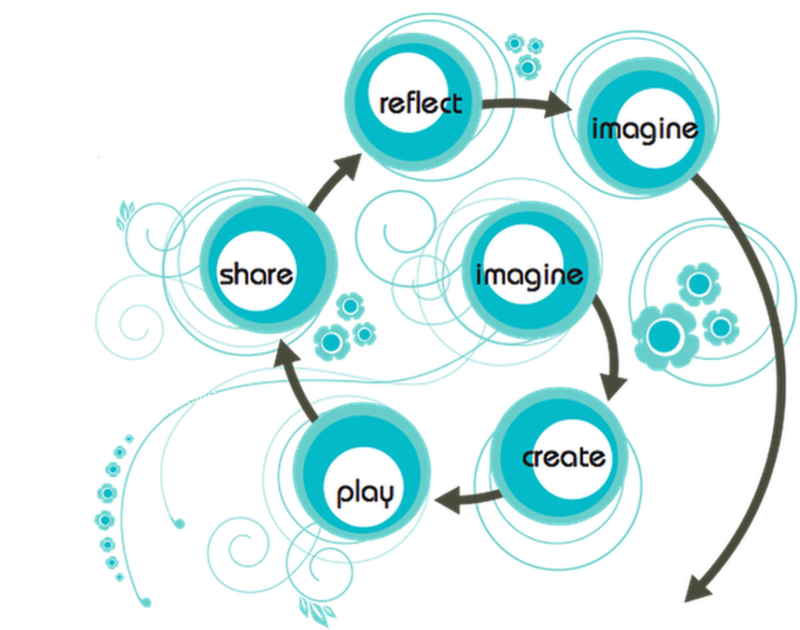 Resnick and his team work from the premise that the “kindergarten approach to learning — characterized by a spiraling cycle of Imagine, Create, Play, Share, Reflect, and back to Imagine — is ideally suited to the needs of the 21st century”. So, what’s that got to do with a Mythbusters? Look closer. That cycle is exactly how they work on the program. Imagine some unusual situation or strange claim. 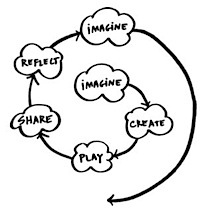 Then create something to test the hypothesis, play with it, share and reflect on the results (usually why things went wrong), and then start the cycle again. Sharing also comes from extensive and intelligent feedback from their audience, some of which is incorporated into the shows. Yes, we should be using Mythbusters as a blueprint for teaching science – in high school as well as elementary. But also math, social studies, art, and so much more.